Meyer Lemon trees exist in the wild due to a cross between lemon and mandarin trees. So to create the scent for this soap, Everyone carefully blended lemon and mandarin essential oils. This is a really nice gentle soap, and it has a wonderful smell. It is soap. It works just as soap should. Smell is nice and I like that it is not a strong perfume fragarence. A pleasant-smelling hand soap with good properties. I recommend it! I keep on purchasin this brand! I have a soap in each bathroom - great scents! this hand soap not only moisturizes but smells delicious. Light refreshing smell. Works great and love that it is all natural ingredients. 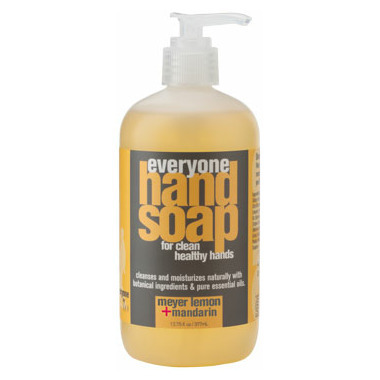 Most hand soaps make my hands break out and itch, this product does not. Also it smells good. Can't say enough good things about this hand soap!!! It is gentle, smells great, the pump provides the perfect amount, and it is perfect in the bathroom or by the kitchen sink. Just bought another 6 bottles to give as gifts. Smells amazing, like all their products! Has a "real" smell, not chemical-like. I'll be buying more! Love This soap... smells sooooo good! Superlative liquid hand soap!! !The smell is divine and the soap cleans very well without drying the skin. We recently had a large house party and guests were querying me on the source of this amazing soap. Doesnt dry skin or strip it. I'm allergic to strong smells, so this just smells great! Very lemony and fresh, doesn't leave my skin feeling stripped and gets rid of all kitchen gunk. I would recommend for a cottage! Delightful. Not drying or irritating to my sensitive skin. Smells lovely without smelling like floor cleaner! Use as bathroom soap. Easy pump, no clogging. Great scent. Love EO products and appreciate Well.ca carrying this wonderful brand. Will buy here again. Nice scent. Fresh and not too strong. Soap works well, not drying. Will buy again. This is a great soap for in the kitchen- eliminates odors left on my hands from cooking, such as onions. Will buy again. This is a light and refreshing hand soap with just enough scent. Love it !